I was recently asked a question about anti-siphon valves that are typically installed at the kitchen sink as part of the dishwasher drain line system. The purpose of the anti-siphon valve is to prevent dirty water from siphoning back into the dishwasher. The question was if these valves could be installed under the sink when a new solid surface counter top is put in place to limit the amount of holes drilled in the service. The simple answer is no, dishwasher anti-siphon valves are designed to be installed above the counter surface and drain connection. An alternative to an anti-siphon valve would be to install a “High Loop” under the sink. 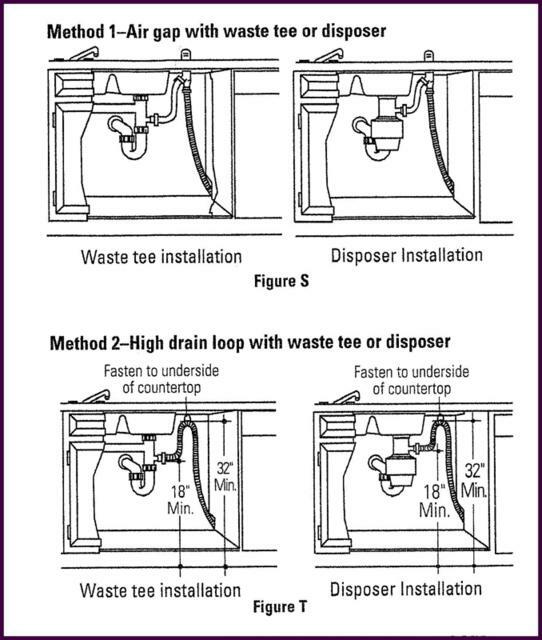 A “High Loop” is where you insure that the dishwasher drain hose is looped up under the sink at the highest point possible above the actual drain line connection with the drain or disposal. This high point should help prevent any back-siphoning into the dishwasher and serves the same purpose as the above counter anti-siphon device. 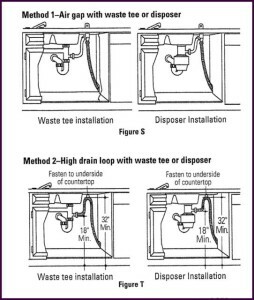 The image below shows the two dishwasher drain methods.